Jehovah’s Witnesses are advised against pursuing a higher education, with the Watchtower regularly providing warnings that attending university is an improper use of time in these last days. The outcome of these warnings is that Jehovah’s Witnesses have amongst the lowest average education and income levels of any religion in the United States, as shown in independent studies, such as the U.S. Religious Landscape Survey 2008 by the Pew Forum. Higher education1 provides benefits at both a private and social level, as detailed in this article; hence religious groups that attempt to take this choice from their followers deserve public scrutiny. Watchtower classifies higher education as a temptation akin to smoking, using drugs, and watching violent and immoral movies. 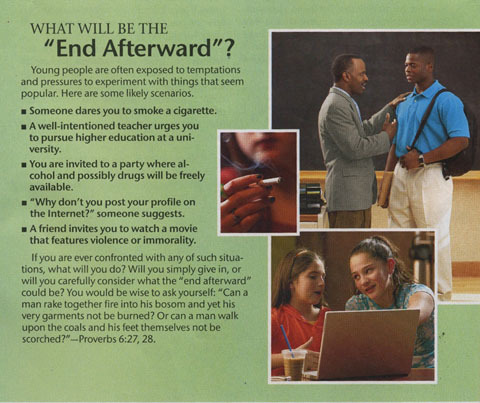 For instance, see the insert from the Watchtower2008 Sep 1, entitled “What Will be The “End Afterward”? There is no compelling validity to any of these reasons, as the following examination will show. The primary reasoning against a higher education has been that the time left is reduced, so the final days of this system should be spent in full service for Jehovah and his organization. This is not a reason to avoid a higher education and a satisfying career, after considering Watchtower originally expected the “new system” to arrive in 1914, and has been saying the end will be soon for over a century. Those that heeded the above 1969 quote are now at retirement age, many working their entire lives in low-paying jobs, often without retirement benefits. Watchtower reasoning that higher education wastes valuable time is of dubious merit, when it recommends an apprenticeship for a trade instead. The additional time taken for a university education is of minor significance, since some degrees take only 1 or 2 years more than a trade. Watchtower has never held back from making long-term commitments and plans for education and expansion. Whilst I was in the Australian Bethel branch in the early 1990’s, Watchtower paid for former Circuit Overseer Vincent Toole to obtain a university law degree, so he could act as their legal counsel. Watchtower’s billions of dollars worth of property globally are part of an ongoing building program. In 2013, a $10 million Assembly hall was completed at Orangeburg.2On 29th July 2013, Watchtower commenced construction of a new global headquarters at Warwick, New York.3 This campus of buildings spans 45 acres, and includes 588 rooms with capacity for 1000 residents.4 It is hypocritical for the leaders to make long-term plans, but insist the followers keep a short-term focus. Watchtower labels those that pursue a higher education as materialistic, and seeking glory. Watchtower mixes cause and effect. Education does not cause materialism or pride; even if the resulting higher wages help satisfy such a person. Materialism is the attitude a person displays to worldly possessions, and is independent of education or wealth. People with lower education and lower wages can be equally materialistic. The paradox is that materialistic people with a lower education are generally required to work more hours to fulfil their desires, for even a basic standard of living, hence taking away time from their service to God. Whilst recommending followers contend themselves with “sustenance and covering,” Watchtower maintains a high standard of living for its leaders, with the new global headquarters at Warwick, New York, being state of the art. Motor Vehicles provided to Circuit Overseers are brand new on 3-year leases, with circuitvehicles.com (28th Sep 2013) showing the current models provided being either Buick LaCrosse, advertised as a “mid sized luxury car,” or the Chevrolet Impala. Concern for providing materially is considered evidence of a lack of faith in God’s ability to provide. This is simplistic reasoning. As per the common motto, “God helps those who help themselves,” those that study hard, or work hard, will do well in life. Those that don’t will struggle; regardless of how much confidence they have in Jehovah’s ability to provide. University is described as a place of debauchery, with this used as a reason to avoid higher education. This reasoning contradicts prior Watchtower comments that there are the “same dangers in high schools and technical colleges and even in the workplace.” (w1992 Nov 1 p.20) Watchtower confuses correlation with causation. Immoral behaviour is not limited to university students, and whilst such behaviour may occur, it is not university but rather youthful experimentation that is the cause. On the other hand, there are university students that adhere to high morals, such as those belonging to strict Christian groups. Exchange students regularly are from cultures with strong traditional values and work ethics. They are highly motivated to excel academically, rather than become distracted by entertainment. Association outside of class and assignments is not a requirement. Whilst I was at university, I did not go to a single “worldly party,” nor go drinking with university friends. I spent time on campus only to attend classes and complete assignments. The article continues that university is the cause of some leaving the faith. This reasoning is comical and misplaced. It is a straw man fallacy, because regardless of how beneficial a divine education may be, it does not enable a person to enter many professional occupations. Watchtower is concerned about the propaganda that University teaches. This may refer to the teachings of philosophy, theology, or evolution that contradict Watchtower belief. However, many degrees do not cover these areas, nor undermine a Christian belief in God. For instance, an accounting degree is regimented, covering accounting and economic issues that do not conflict with Watchtower theology. This can also be said of many disciplines, including engineering and information technology. Watchtower reasoning against higher education contains little validity, being both illogical and at times contradictory. Education is not the cause of materialism, and bad associations can be avoided at university, as with every endeavor in life. The additional time involved to complete a degree is minor in comparison to the length of a person’s career, and history proves Watchtower predictions for the imminence of the world’s end to be ill founded. It would appear that there is a more imperative reason the Governing Body fears followers attending university. Higher education teaches not only job skills, but also how to research and evaluate information. University education can improve critical thinking skills, which will assist students identify flawed Watchtower reasoning. As shown at Misquotes, Deception, Lies (Link to jwfacts.com/watchtower/misquotes-deception-lies.php), Watchtower publications rarely provide adequate reference for quotes, which regularly are inaccurately presented, something university teaches students to be sensitive to. Watchtower doctrine has been in a constant state of change, showing that it is not pure truth, yet a Witness is not to question doctrine, even when later changes show it was false. A person with a higher education is more likely to identify doctrinal arguments that are incorrect and poorly structured, and become a danger to the organization. Hassan identifies control of information as critical in keeping control of followers. The concern Watchtower has over the information a university student will obtain is typical of high-control religious groups. This should be viewed negatively as a form of manipulation, as people have a right to make educated, information based decisions, not directed to believe something based on carefully screened material. From inception, Watchtower leaders took issue with the education system, bemoaning teachings that contradict a literal interpretation of the Bible. 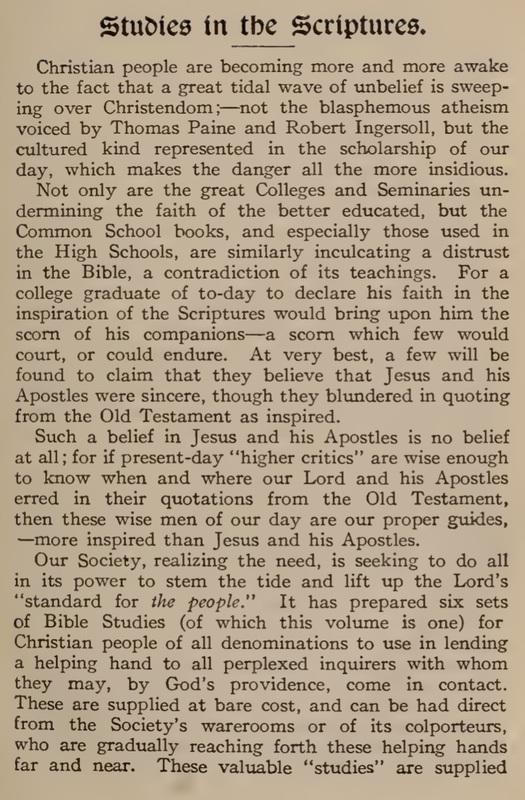 The foreword of the 1911 editions of the six Studies in the Scriptures decried colleges as undermining faith in the Bible. “Q57:1:: QUESTION (1910)–1–Should the saints go right on and educate their children in this day for earthly positions, knowing they will not get into those positions in this age? Will such an education (college or university) be of value in the Millennium? Russell’s answer contained the same reasoning as today. The end will be so soon that Watchtower followers will not get to use their education in this system, and that educated people are likely to stop following the Bible. This mentality has continued for over a century. 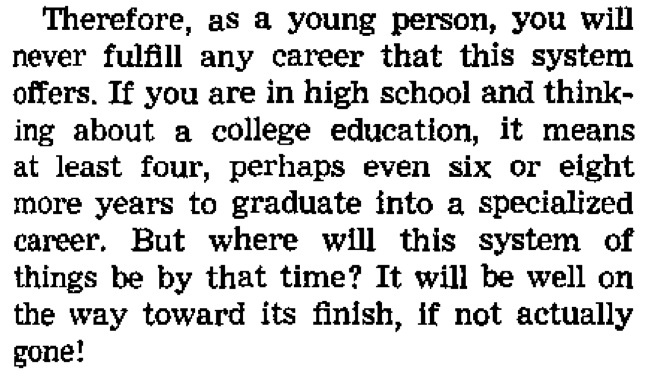 Over 40 years ago, young followers were told that a college education was pointless, as the system of things will likely be finished before they graduate. Jehovah’s Witnesses that followed this advice in the 1960s, and relinquished opportunities to pursue an education and successful careers, are now at retirement age. Comments on Internet forums identify many from that era as financially unprepared for retirement, having worked in low pay jobs, or spending years in voluntary service to grow the Watchtower organization. A short-term view of the future is of no benefit, and has proven to be detrimental to many Witness families over the last century. Twenty years later the same misguided advice was given. I came under criticism for commencing a Bachelor of Commerce in 1987. I was told that accountants were not going to be required after Armageddon, and should learn a trade. This is in line with Watchtower comments, such as the Awake! 1969 May 22 p.15, which had stated, “trades such as carpentry, plumbing, and others, will be useful not only now, but perhaps even more so in the reconstruction work that will take place in God’s new order.” Witnesses in my district complained to local Elders and the Circuit Overseer. Since I was a regular pioneer and assisted with quick-build kingdom halls whilst at university, the elders found it difficult to be overly critical of me, when I was so obviously putting the Organization first, more so than most of those levelling the criticism. The result is that I now have a fulfilling career and comfortably provide for my family. 1992 saw a brief respite to the Watchtower’s criticism of Jehovah’s Witnesses attending university. It was acknowledged that in many countries a higher education was needed for jobs that could support their families. Better-paid jobs meant less overtime, and more available time for meeting attendance and preaching. 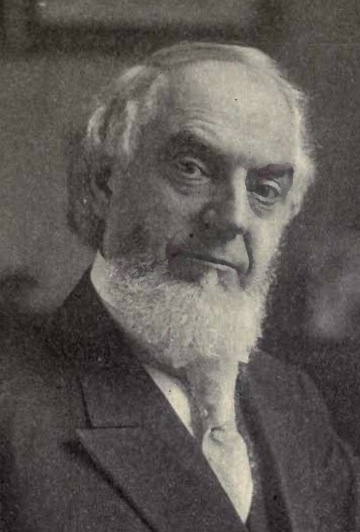 Watchtower also required educated brothers to fulfil roles at Bethel. Attending university was considered acceptable, provided motives were pure and courses selected with care. Barbara Anderson worked in the writing department at the global headquarters, Brooklyn Bethel, during the 1990s. Anderson recalls that Governing Body member Lloyd Barry, who himself had a university degree, was behind this new stance on education. Anderson provides a second reason for the change. It was not until October 2005 that pursing “Higher Education” was again specifically discussed in the Watchtower. Once more, criticism against higher education started to be released regarding the cost, immoral environment, time pressures, and lack of spiritual focus. Anderson provides an explanation for this back flip. Another possible explanation are falling growth rates since 1995. (See jwfacts.com/watchtower/statistics.php) The Governing Body possibly attributed this to higher numbers of Witness children graduating university. Whilst university attendance may have affected growth, other factors have also been at play, such as freedom of information available on the Internet, and the growing irrelevance of the generation13 and 1914 doctrines. Since 2005, there have been regular articles against advanced education. A Watchtower Outline for Meetings of Circuit Overseers with Congregational Elders and Ministerial Servants for the period March through August 2008 explained that promoting higher education could result in demotion. Higher Education provides a range of benefits at both a personal level and to society in general. Personal benefits extend beyond just earnings potential, and include job security and contentment, along with higher quality of life. It comes as little surprise that the U.S. Religious Landscape Survey 2008 by the Pew Forum identified Jehovah’s Witnesses as having the second lowest level of Post Graduate degree educated members, and lowest level of families earning over $100,000. Source economix.blogs.nytimes.com May 13 2011, based on 2008 USA Pew report. An educated population also provides a range of social benefits. Higher levels of education lead to a more productive and progressive workforce. 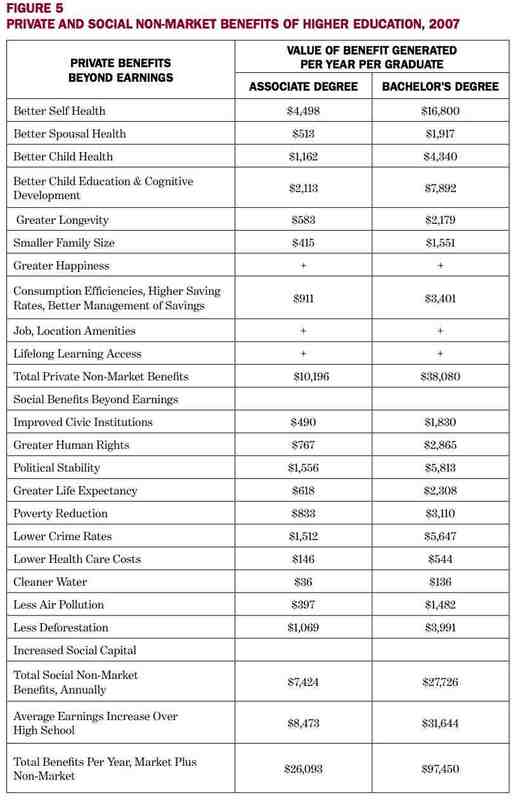 People that obtain a higher education are also more conscious of looking after their health, other people and the environment, as quantified in the following table by McMahon. Education is vital to improving world conditions. The scientific revolution has led to a dramatic increase in living standards and human rights. Over the last 200 years, life expectancy has doubled in developed countries, from around 40 to 80 years.14 Philosophical enlightenment is behind the abolishment of slavery and improvements in women’s rights. Progress remains to be made, and education is the driving force behind further improvement. Regardless of a person’s religious outlook, everyone should appreciate the enhanced living standards that education provides. It is not difficult to identify the double standard behind this stance on higher education. Jehovah’s Witnesses make full use of educated professionals, and would not think of undergoing surgery or boarding an aircraft if the surgeon or pilot did not have the relevant degrees and accreditations. The hypocrisy is greater when considering Watchtower headquarters requires and actively seeks out Jehovah’s Witnesses with university degrees and professional accreditation. This includes qualified accountants and auditors, architects and engineers, doctors and dentists, lawyers, and information technology specialists, without which the global preaching work would not be possible. On a periodic basis, Watchtower beseeches congregations for brothers with professional degrees to volunteer. Mexico Branch sent an elders letter on 4th September 2018 to congregations requesting any spiritually fit brothers that are legal professionals identify themselves, and make themselves available as volunteers for when the need arises. A similar letter was sent from the Australian Branch to Congregation Service Committees, dated 18th November 2015. It asked, “We confidentially seek your assistance in identifying spiritually mature baptised individuals in the local congregation who are also qualified as solicitors, barristers, certified practicing accountants or charted accountants. We request you not to speak directly to any publisher in the congregation who you feel fit this criteria …” The Service Committee was expected to send a list of intricate details on any individuals that fit the criteria. Back in 2004, a similar letter was read out to congregations in the USA, once again requesting educated professionals to volunteer their services to Bethel. Whilst not directly prohibited, Watchtower’s ongoing negative comments against higher education place psychological pressure upon teenagers when considering their future education and careers. It is hoped that articles such as this alert young Jehovah’s Witnesses that the Watchtower is not a reliable guide regarding the future, and to plan wisely for their careers. If you are a Jehovah’s Witness student contemplating your career, carefully consider the wisdom in planning for your future. It is highly likely that you will at some point settle with a family, and you do well to take steps now with that in mind. Teachers, career advisors and others assisting young Jehovah’s Witnesses in deciding the best course after high school can point them to the more balanced information contained in the Watchtower during the 1990’s, particularly the Watchtower 1992 November 1. That way they may feel more at ease with pursuing Advanced Education, if that is going to be an appropriate option. For the purpose of this article, higher education refers to a University education, as defined by the Watchtower. Why Don’t US school do this in biology?